This one-skillet dinner tastes even better than it looks. 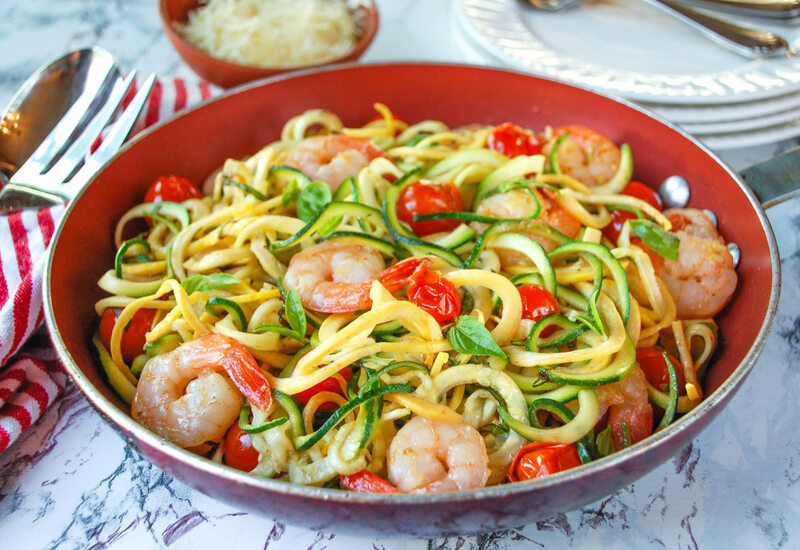 Colorful, spiralized yellow and green squash noodles give this easy dinner a fun and healthy spin. Summer squash's mild flavor makes it a perfect pasta substitute, plus it's packed with nutrients. Pan-roasted cherry tomatoes and shrimp complete the dish. The sauce is a simple mix of garlic and white wine, and the result is a vegetable-rich meal that's gluten-free, low-carb, and is ready in under 30 minutes to boot. The veggie noodles cook so quickly, you'll have dinner on the table in no time! For a vegetarian dish, omit the shrimp and add another cup of cherry tomatoes to the pan. To make the dish paleo and Whole 30-compliant, make a few easy adjustments. Use ghee instead of butter, vegetable broth in place of the white wine, and omit the cheese. Per Serving: 354 calories; 19g fat; 12.3g carbohydrates; 29g protein; 265mg cholesterol; 1135mg sodium. Nice summertime dish. Used vegetable broth instead of white wine and still loved the flavors through it. Great option for when I want to taste a carb break. We loved this recipe! So easy and fast! I didn't have white wine or vegetable broth so I used chicken and it had great flavor! This was so fast and I loved the wine glaze! The crunch is so yummy and my fam loved this. Probably one of my favorite summer recipes! I always use extra jumbo shrimp, tail removed, and diced roma tomatoes. I use wayyy more than two tablespoons parmesan though. I love to grate fresh cheese on top. So good. We took the shrimp and instead of using zoodles, we did cauliflower rice instead. This was perfect for our weeknight dinner.